Montecristo Artisan Series are the newest hand-rolled premium cigars from the renowned Grupo de Maestros from Altadis USA. Montecristo Artisan premium cigars are handcrafted individually by highly skilled cigar rollers using the finest Dominican tobacco available. Each of these cigars are constructed using Dominican binders with expertly blended mixtures of Dominican and Honduran long-fillers, and wrapped up perfectly inside an aged Ecuadorian Habano tobacco leaf. Montecristo Artisan premium cigars produce a medium to full-bodied smoke with smooth coffee and cream flavors. A great addition to any cigar connoisseur’s humidor! 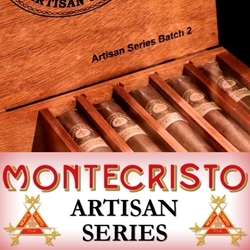 If you looking for a great smoke at a great price, the Montecristo Artisan Series are hand-rolled premium cigars that will deliver time and time again. Smokers Discounts has made it easy and affordable to buy premium cigars online. Each of these styles, sizes and flavors are in stock and available at a low discount price. Call us for more details!